Do your kids enjoy playing Simon Says? It's such a classic game that kids love playing over and over again. When I taught 1st grade a few years ago I used to play Simon Says Draw with my class. They LOVED it and it was a great way to practice following directions while having FUN. 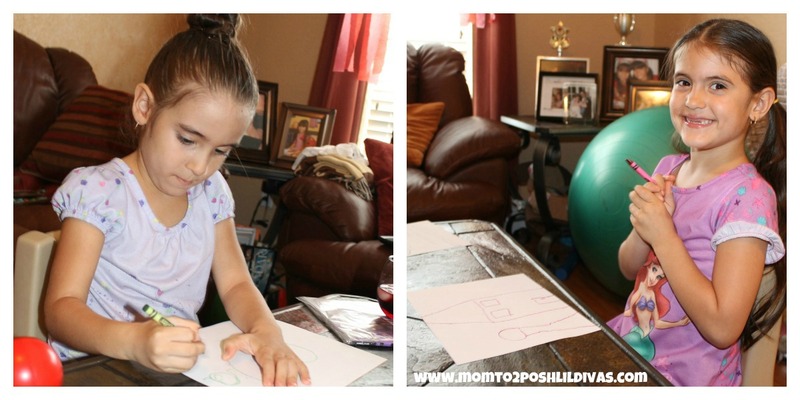 I decided to introduce the Lil Divas to Simon Says Draw this summer and added it to our Summer FUN List. We all had a great time playing as a family the other night. 1. Give everyone paper and pencils/crayons/markers/pens to play with. 2. One person will be "Simon" and will be responsible for giving out the directions for drawing. 3. Simon gives out directions by saying "Simon Says + direction". For example - Simon Says draw a large circle. 4. All players will draw what has been instructed. Beware if Simon does not say Simon Says! 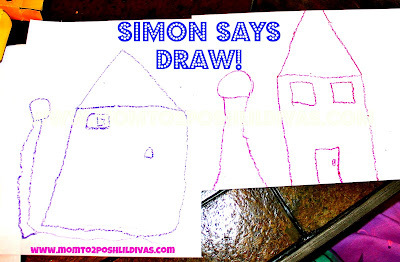 During my turn as Simon - I gave instructions for drawing the house and tree picture above using shape descriptions. For example - Simon says draw a large rectangle. Simon says add a large triangle on top. This was the 1st round we played and I think the Lil Divas did great. 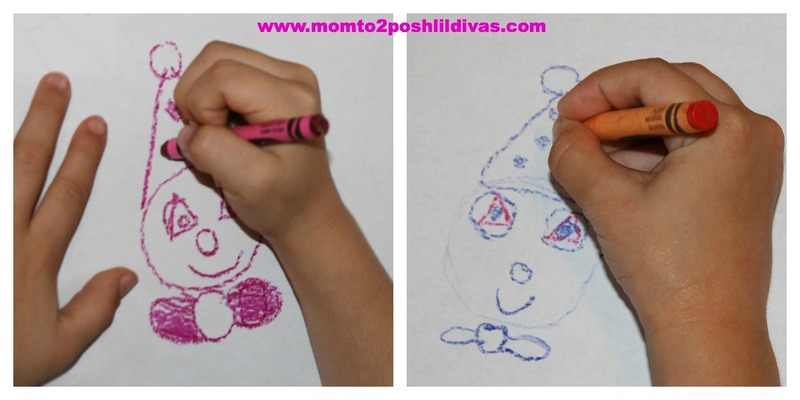 The purple drawing was done by the youngest Diva and she got confused on a few of the directions so you can see the difference in their interpretation. During another round I had them draw clowns also using mostly shapes. You can see below that even the youngest Diva really caught on to the game and was great at following directions. This is a game we will surely be revisiting often. The Lil Divas had lots of fun drawing and coming up with pictures to give directions for. I really like that it's also a sneaky way to reinforce a skill that is very important in school - following directions. 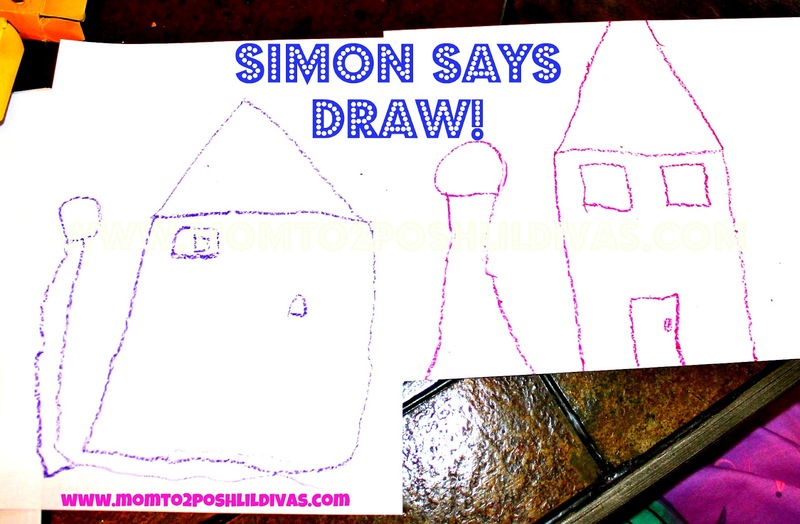 Have you played Simon Says DRAW? If not, you really must try it! LOVE this idea..I'm going to incorporate it in a library program this summer! That's a fun twist to Simon Says. I'm going to try that with my preschooler. Going to use this game with my two grandchildren on our long plane ride to Hawaii in August. I did something like this with my second graders before I retired so I'm very glad to see your post.